Mormon.org has published a new video featuring Latter-day Saints sharing what they believe—in just 60 seconds. If you’ve ever wondered what Mormons believe, here’s a bunch of Mormons sharing their beliefs in 60 seconds. 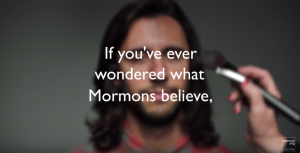 What do Mormons believe? You likely have a lot more in common than you thought. Buckle up because you’re about to hear a lot of Mormon beliefs coming at you rapid fire. Learn more at mormon.org/beliefs.